Andy Karl in Rocky. Photo from rockybroadway.com. BOTTOM LINE: A shining example of the right way to adapt a film into a musical, Rocky hits every mark. Every news article I read heralding the coming of Rocky to Broadway included someone giving the reaction “Rocky? A Musical? Really?” which is of course the same initial reaction I had. 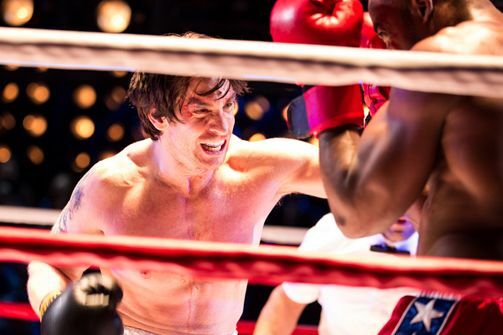 How could a film generally targeted at a straight male audience about an aging failure of a boxer be a Broadway musical? Granted there is a pat love story between Rocky and the homely sister of his friend, and the almost inevitable fact that he becomes a success in the end. But the passion of everyone involved with this musical is apparent within the first familiar opening chords and carries through all disbelief to create a powerhouse of a production that is both exhilarating and touching in equal measure. Thomas Meehan and Sylvester Stallone have crafted a book that is completely faithful to the source material, supported by a score by Stephen Flaherty and Lynn Ahrens that is as effective as it is sparse. Unlike many other adaptations, the creators of Rocky aren’t afraid to have extended sequences of dialogue where music isn’t necessary, and every choice of song either serves to propel the story forward or to explore the depths of a character that can't be expressed in mere words. This is what really elevates the show to a level that I completely did not expect. Characters sing in musicals because music exposes emotions that can’t be exposed through speech alone: when applied to Rocky and Adrian this is has a far more pronounced effect. These are characters who are unable to use words properly in any context -- for Rocky, from lack of education and for Adrian from lack of confidence. However giving them life in song allows the characters to transcend their backgrounds and become a magnetic stage couple. Of course part and parcel of this is Andy Karl proving that he has always been a star just waiting for the right role and Margo Seibert making quite a mark with her Broadway debut. Perhaps it is true that the score isn’t full of hummable or memorable tunes, however the songs for the two leads are right on point. Some of the ensemble numbers, Mickey’s ‘good ole days’ ballad and particularly Apollo’s big number are indeed a bit awkward, but those form such a small part of the stage time of the show that it is easy for me to overlook. The real star of Rocky, however, is director Alex Timbers, who applies a unique vision to the stage as previously seen in his Here Lies Love and Peter and the Starcatcher, now given a massive budget to really pull out all the stops. Yes the climactic fight is a scenic tourist trap the likes of a chandelier or helicopter, but it makes that trick work in a completely narrative format. The rest of the scenic, video and lighting design (by Christopher Barreca, Dan Scully & Pablo N. Molina, and Christopher Akerlind respectively) is epic and impressive every step of the way, with far more magic than the last few outings of Disney on the New York stage. It has been quite a while since I’ve had the desire to go back and see a show from multiple angles, but Rocky has me ready to make several return trips.